Calgary RATH are the National Ringette League champions after downing the defending champion Atlantic Attack 5-3 in today’s gold medal final at the 2019 Credit Union Canadian Ringette Championships. Calgary’s last gold-medal win was six years ago at the 2013 event in Fredericton. The Cambridge Turbos go home with bronze. In the U16 division, Team PEI made their first ever appearance in a medal game at the Canadian Ringette Championships when they met Calgary Core for gold. In front of a hometown crowd, PEI battled it out but in the end Calgary came away with a 5-1 and the gold medal. PEI Wave claim silver and the first-ever national medal in the 41-year history of the event. In the bronze-medal game earlier in the day, Team New Brunswick beat West Ottawa 5-2 to claim bronze. In the U19 division, Team Ontario (Guelph Predators) beat previously undefeated Laurentides (QC) 5-3 to win gold today. Guelph’s Lydia Duncan picked up two goals in the win and was absolutely beaming following the game. In earlier U19 play, Calgary Rush downed the Nepean Ravens 5-4 to claim bronze. Games have been taking place at Credit Union Place in Summerside, Bell Aliant Centre in Charlottetown, APM Centre in Cornwall and Pownal Sports Centre in Alexandra. All-stars and the NRL Annual Awards will be announced at the closing ceremony on Saturday night in Charlottetown. For more information on the event, including links to rosters, schedules, standings and stats can be found at www.crc2019.ca. Ringette is a Canadian sport that was invented in 1963 in North Bay, Ontario by the late Sam Jacks. There are currently over 30,000 players on nearly 2,000 teams across Canada, with over 1,500 officials and nearly 8000 coaches. Internationally, it is played in more than a half a dozen other countries around the world. 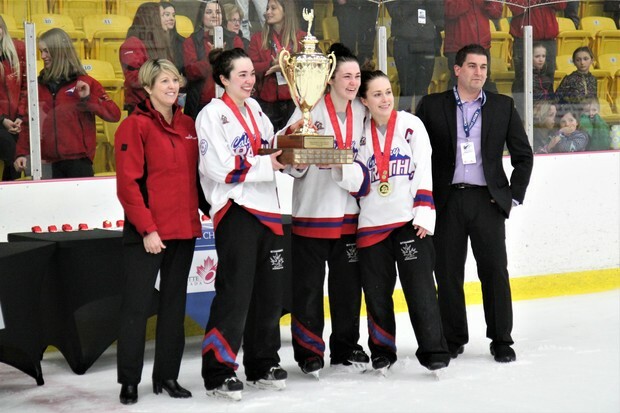 Ringette has been designated a Heritage Sport by Sport Canada and as part of the Sport for Life movement, ringette is well advanced at adapting Sport Canada's Long Term Athlete Development model. For more information, please refer to the Ringette Canada Web site at www.ringette.ca.